Poekilopleuron had the misfortune to be discovered in the early 19th century, at a time when virtually every large theropod was being assigned as a species of Megalosaurus (the first dinosaur ever to be named). An amazing number of famous paleontologists were involved, in one way or another, with this dinosaur: the type species, Poekilopleuron bucklandii, was named after William Buckland; in 1869, Edward Drinker Cope reassigned a now-defunct genus (Laelaps) as Poekilopleuron gallicum; Richard Owen was responsible for Poekilopleuron pusillus, which Cope later changed to Poekilopleuron minor; and later still, Harry Seeley reassigned one of these species to an entirely different genus, Aristosuchus. 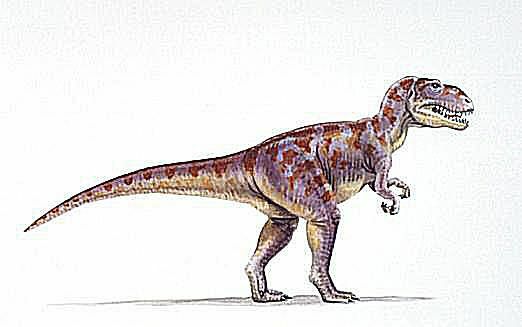 Amidst this frenzy of Poekilopleuron activity, at least one species of this middle Jurassic dinosaur was assigned to Megalosaurus, though most paleontologists continued to refer to Poekilopleuron by its original genus name. Adding to the confusion, the original skeleton of Poekilopleuron (Greek for "varied ribs")--which stood out for its complete set of "gastralia," or ribs, a rarely preserved feature of dinosaur fossils--was destroyed in France during World War II, so paleontologists have since had to make do with plaster replicas (a similar situation prevails with the much bigger meat-eating dinosaur Spinosaurus, whose type fossil was destroyed in Germany). Long story short: Poekilopleuron may or may not have been the same dinosaur as Megalosaurus, and if it wasn't, it was a very close relative!